As usual, I went to the Bulletin Board first thing to see if there’s any news for the day. And there is! Another Spotlight Item that I already have – the Dracaena! Great. And also, Nookington’s will be closing after today. 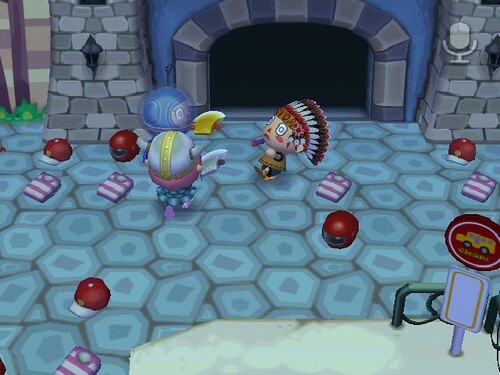 No store access in Shaolin tomorrow, and we will be downgrading allll the way down to Nook ‘n Go to get those great hours back! Maybe I’ll get sick of the small amount of flowers on sale each day, but I doubt it. I could always switch it back in a few months. Anyway, today Vella is throwing a Costume Party over in Doomdoom, so I rushed to the gates at 3PM. Apparently there was a little time mix up, but eventually the guests started coming in! You can't tell, but that's Jake in that King Tut costume! Jake arrived first, sporting a King Tut costume. Great job, we could barely recognize you, Jake! 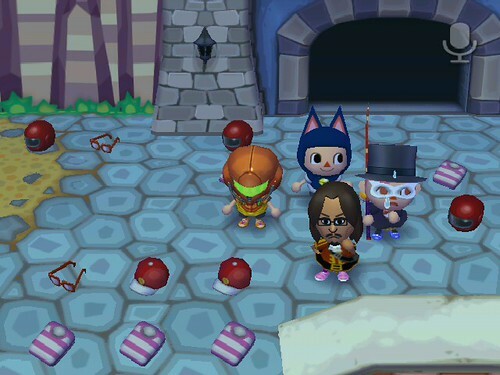 Next, our friend Emma came by (aka Ifetayo) and we started a friendly game of ‘lets hit each other with an axe!’ Not long after, Jed arrived and seeing as we were all dressed as pirates and he wasn’t, we decided to play hide and seek – 3 against 1. Jed took off and we all chased him to the Museum. Then we split up and searched the various rooms of the Museum to find Samurai Jed. But we didn’t realize, he was changing costumes while he was hiding! I finally found him in the Observatory. He had changed into a Detective Outfit, that sneak! He rushed off and we continued to chase him until we decided it was time for a breather! We congregated at the gate to take a nice group photo. A nice, albeit off center, group photo. Once we had caught our breaths, it was time for a little tour of Doomdoom! 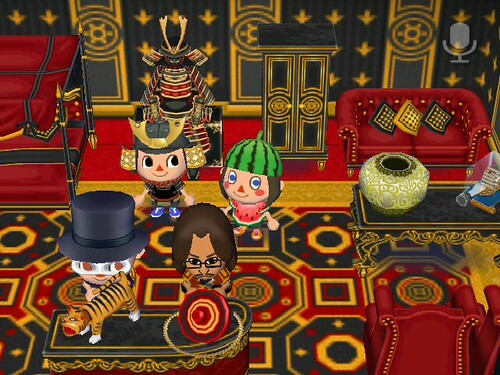 We especially liked hanging out in the Gorgeous room, because Jed matched the Samurai Suit that was on display. But I had the most fun when we went down to the Boxing Ring in the basement. We were able to get all four of us on the mat at once, and started bouncing off one another! 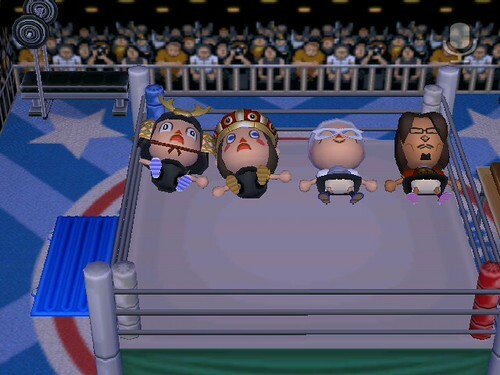 I guess this is AC’s form of wrestling? It’s a little wierd, but whatever! It looks hilarious! All in all, it was an excellent party!! It made me excited about planning an event for Shaolin – a Photo Shoot! 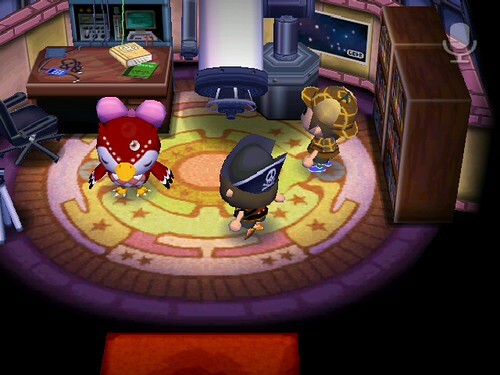 I’m setting up some rooms in my characters’ houses to have certain themes, and then I will invite friends to come over dressed up in costumes that will match the room! It’ll be great. But I still have more coordinating to do before I can announce a date for this event. So stay tuned! I’ll post the event on ACUKE when I’m ready, but if you’re not a member that’s ok! You’re still invited! I’ll post info here on the blog once I decide on a date. 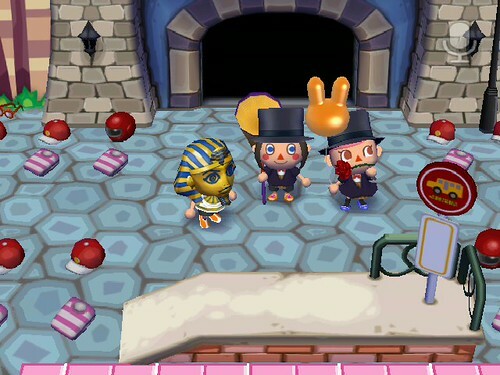 I hope everyone will come to my party too! I love the “let’s hit each other with axes” game … too funny LOL!! And the hide n seek looks fun too, especially going in buildings! I don’t get to play too much during the =( but I do on the weekends and in the evenings during the week, when certain games aren’t on 😉 Hope we can meet up sometime … BTW, I only have USB keyboard and not Wii Speak … YET! !